All original Gibson Kalamazoo `75 SG Standard. Real deal 43 odd year old survivor. NO pickup replacement in the `80s. Gibson USA SG Special from mid 2000 production. In above average condition for age, signs of general player wear. No headstock or heal breaks. Frets about 85%, some minor low spots, but plays buzz free up & down the full length of the neck. More good stuff for the Olden Golden Days of Fender Japan. M.I.J. N series (1993-94) produced `72 Telecaster reissue. 3 piece body with natural finish really harks back to a real `70s Fullerton Fender! Fender Japan Used & Vintage ~SOLD~Fender Japan M.I.J. "T" series `62 Custom Telecaster R.I.
As new, production from 1-2 years ago. Virtually untouched, bar exchange of bridge saddles for brass.Comes with 12 month in-shop warranty & F.J. gigbag. Absolutely dead mint original M.I.J. E series Tele Custom reissue with original brown gigbag & warranty card with matching serial number. From the Golden Age of Fender Japan, 1984-87 production. Real "under the bed" condition, 100% original from tip to tail. Original Fender Japan A series 1985-86 produced `57 Strat in classic 2 tone sunburst. Serial number on neckplate. In solid 9/10 condition, all original. Absolutely "as new" 2014 production Fender Japan reissue `60's Jazzmaster in Candy Apple Red with matching headstock. Still has plastic on the pickguard. A few player marks from being tried in the shop here. Near mint condition C.I.J. "P" series Fender Japan `72 Telecaster Deluxe 1999-02 production. Super rare & sure to become collectable as there will never be any more like this they say. 9.5/10 condition Crafted in Japan R series Jaguar reissue from 2004-06 prodution. Finished in Candy Apple Red with matching headstock. More details to follow. We have had a few of these over the years & I can honestly say this is the lightest example I can remember ever being in stock. 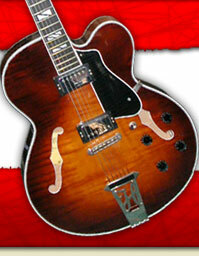 It has the usual Keef features, brass bridge, humbucker in the neck position, changed machine heads. We could even remove the bottom E string if required! Fender Japan Used & Vintage ~SOLD~Fender Japan C.I.J. "O" series `62 Stratocaster R.I.
1965 Fender Mustang in rare Daphne (maybe Sonic) blue. Complete with original case. In great condition for a 40+ year old guitar. Been a while since we had any variety of J TV Yellow goodness. And this one is as good as it gets.